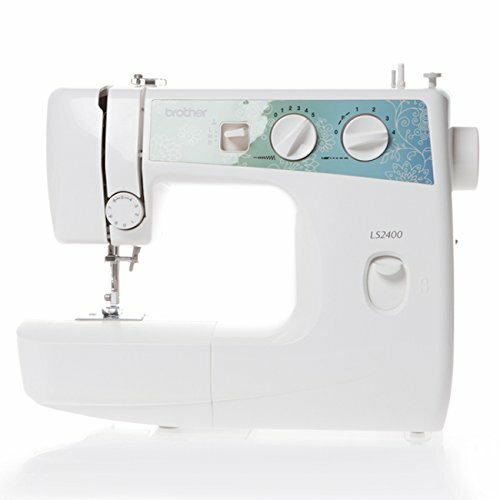 Feature wise Brother LS2400 is not an ideal beginners sewing machine, but performance wise it is as good as cheaper machines. LS2400 will be a good option for those who are looking for budget friendly beginners sewing machines. It is one of the inexpensive Brother machines around. It comes with 2 built-in stitches (straight and zigzag) and has 20 stitch functions. Stitch selection can be done with the help of a dial. Stitch width and length can also be adjusted with the dial. Maximum stitch width and length are 5mm and 4mm respectively. The powerful motor of LS2400 really surprised me. It is as good as that of cheaper machines. The motor can deliver 900 stitches/minute (pretty impressive for such a low cost sewing machine). 3 needle positions are available on this machine. The sewing surface is free arm convertible. The machine seems to be built with quality material. It weighs around 15 lbs, which is a clear indication about the built quality. The sewing light comes really handy while working in low light conditions. Feature wise Brother LS2400 is not the best beginners machine around (which we will discuss in the limitations section). It lacks some of the basic features that beginners will look for. But LS2400 makes up for all of them in performance and pricing. It is a solid machine with pretty decent performance. It may be a low cost machine, but it is not a toy at all. The unbelievably powerful motor works its charm while sewing at high speeds. There is no automatic needle threader. You will have to thread it the old way. No drop-in bobbin means you will have to remove the storage compartment to change the bobbin. Definitely not a beginner friendly feature. No buttonhole styles (another bummer). No drop feed or free-motion (another let down). Brother LS2400 has to be priced very low (yes, I mean it). If the price is anywhere close to high, you have better options from Brother itself. So check the price and make sure that it costs well below the price of Brother XL2600I. XL2600I is a far better option if there isn’t a huge difference in price. XL2600I comes with 25 built-in stitches, automatic needle threader, drop-in bobbin, 1-step buttonhole, drop feed and more. XL2600I literally comes with all the features that LS2400 lacked (from the point of view of a beginner). It is a cute little workhorse. It is called the “King of Low Cost Sewing Machines”.